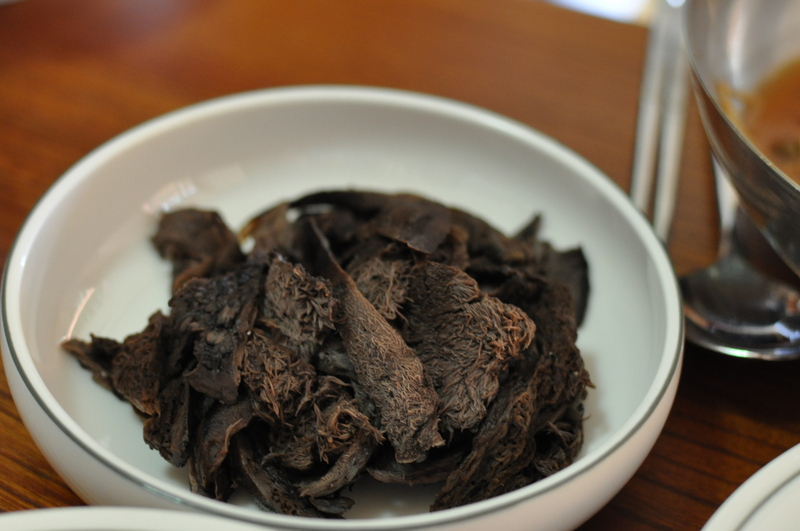 No meat, no fish, no garlic — Could this really be Korean food? I love garlic. I love garlic more than I love meat, though I love meat as well. In that way, I am a proud child of Korea, where we eat more garlic per capita than any other country in the world. So I was shocked when I found out recently that devout Buddhists in Korea generally eat a diet that avoids not only meat and fish, but also garlic, scallions, onions, and leeks. I was even more shocked that I hadn’t missed the garlic when we ate lunch at a Buddhist temple during our trip. The morning after eating still-wriggling live octopus, we drove to Chirisan National Park to eat a lunch of 사찰음식, sachal eumshik, or temple food. Diane’s great-aunt is a devout Buddhist, and she has long had a relationship with this temple and its monks. So when we told her that we would be driving through South Jeolla Province, she generously arranged for us to eat lunch at this temple, where meals aren’t normally open to the public. Korea is too small a country to really contain wildernesses. Our national parks often surround Buddhist temples, as the Buddhists retreated into the mountains when persecuted during the Choseon Dynasty. 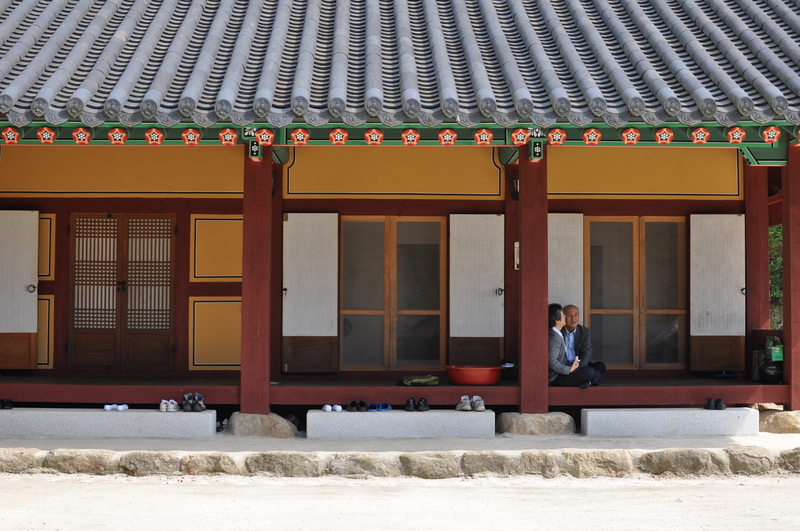 Chirisan National Park houses seven temples, including Sanggyesa and Hwaeomsa, two of the most famous temples in Korea. That’s really all I can say about temples. I grew up an ignorant Presbyterian. But I do have an opinion on what we ate. 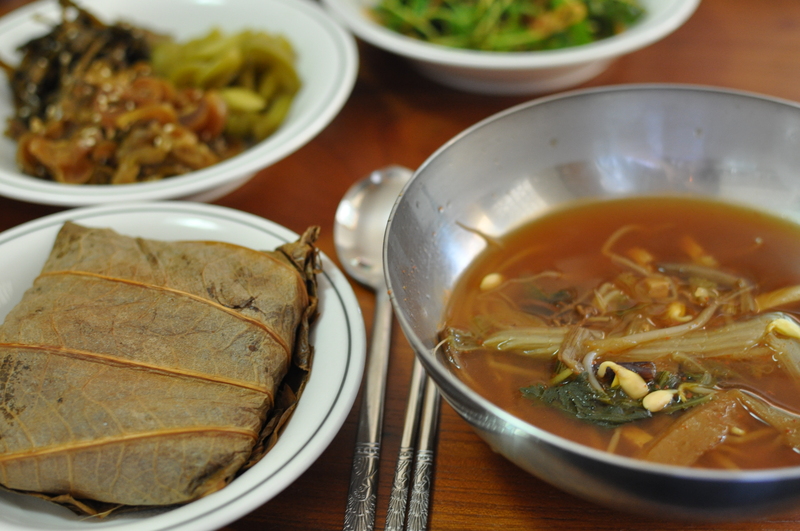 Temple food is popular in Korea even among those who are neither Buddhist nor vegetarian. Koreans love their meat, but they’ve always eaten their vegetables. Before the Buddhists were driven into the mountains by the Choseon Dynasty, Buddhism was the favored religion of the preceding Goryeo Dynasty, which encouraged the development of vegetarian Korean cuisine. But the Buddhist elites weren’t ascetics. Temple cuisine developed with influences from royal palace cuisine, which I could see in the delicate tofu-stuffed spinach packages we were served. 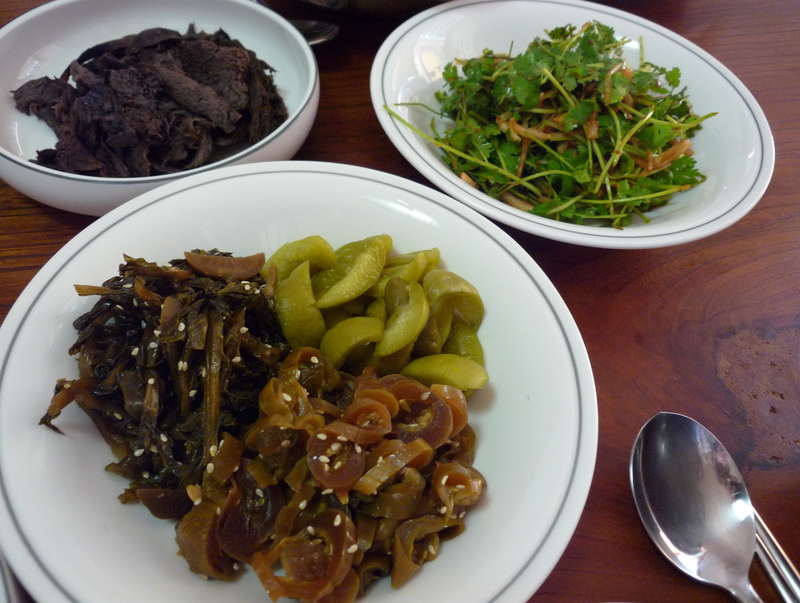 For them, their dietary prohibitions were no reason not to eat a wide and varying range of foods, and I think we have the Buddhists to thank for the many wild greens, like fern bracken and bellflower root, that are common in a Korean diet. That, and the hunger borne out of bad harvests and poverty. Michael Pettid, in his book on Korean culinary history, cites a 1554 text called “A Concise Reference for Famine Relief,” describing 851 types of edible plants and herbs. The lunch we were served was a beautiful example of the Korean love of namul, the catch-all phrase that describes most vegetable side dishes, whether lightly cooked and seasoned or raw, crunchy, and fresh. 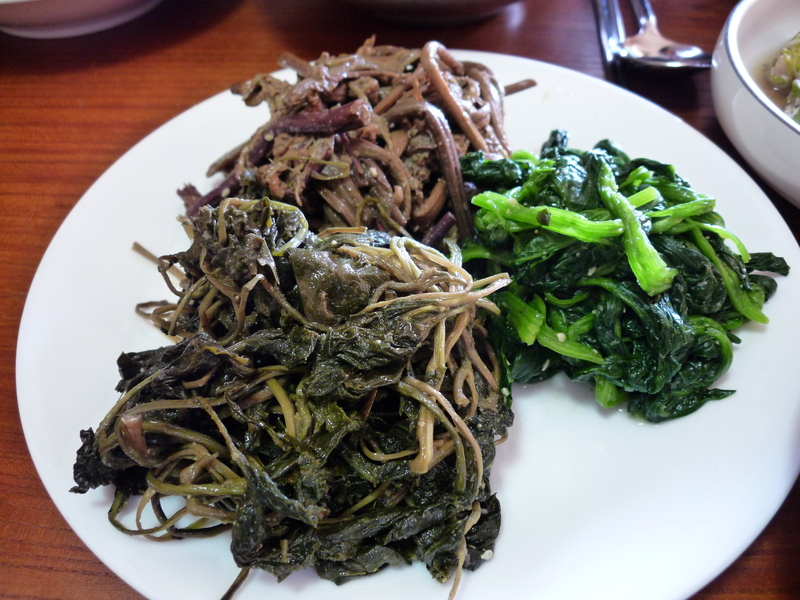 On one plate was a trio of namul, which is the way they’re often served, to better show their contrasting colors, spinach or sigeumchi-namul, fern bracken or gosari-namul, and wild aster or chi-namul. The spinach was tender, just slightly blanched. The gosari was obviously freshly gathered rather than dried, as it was chewy without the toughness of dried fern bracken. But my favorite was the wild aster, which has a strong, somewhat bitter taste that goes so well with just a bit of soy sauce. Here, you can see something that looks like cut-up brown towels. They’re neungi mushrooms, also known as koutake mushrooms in Japan and apparently known nowhere else, as the only other name I can find for them through Google is the Latin sarcodon aspratus. They’re rare and expensive but were served to us in luxurious quantities. They were a little spongy. Even more luxurious, and more delicious, were the songi or pine mushrooms (also known as matsutake mushrooms in Japan) we were served. (You can see the tofu-stuffed spinach leaves behind them.) 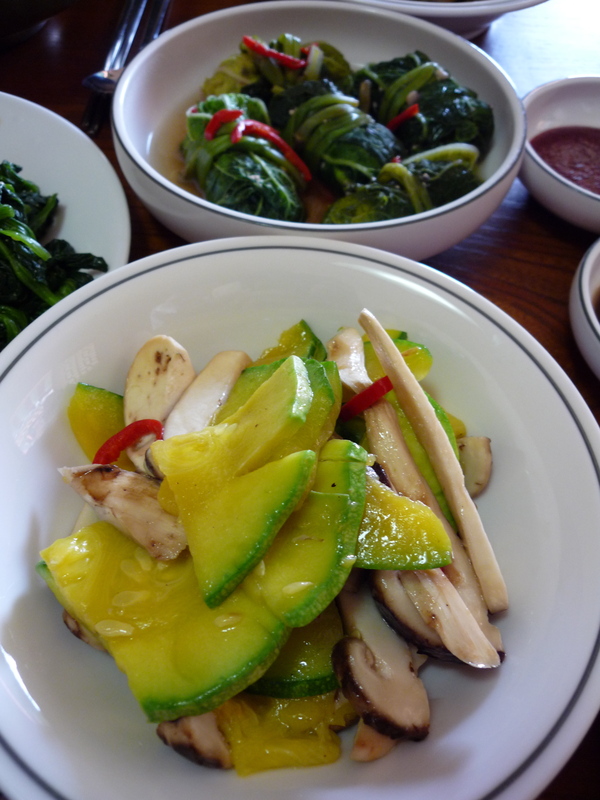 Sauteed with half-moon slices of Korean summer squash, they were firm and sweet. Diane’s father marveled at how they had that true pine mushroom smell. When we got back to Seoul, I saw boxes of them being sold at swank department stores for $100 a pound. There was so much food, we couldn’t eat it all, but when we left the songi mushrooms, we were told, “You can’t leave the precious songi mushrooms!” So we ate them, every bite. The vegetables we ate were proud to be vegetables. 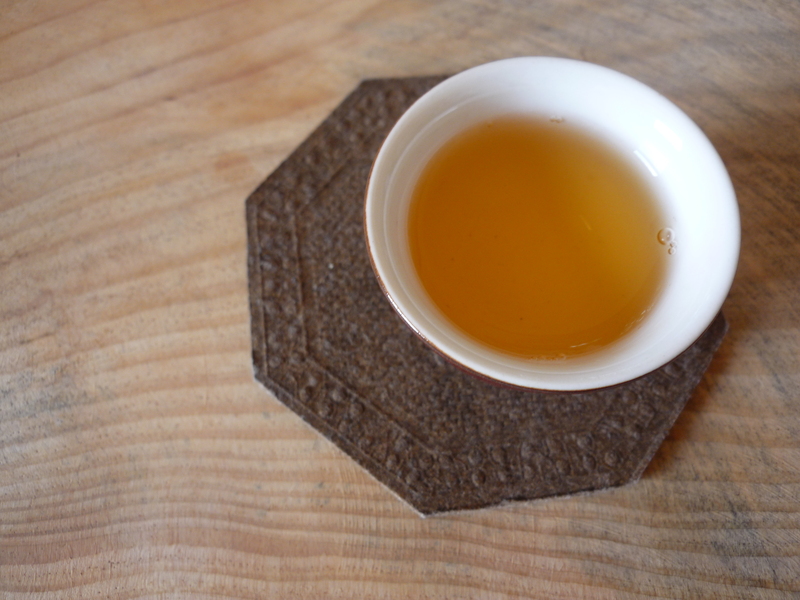 There was a clarity of flavor, an assertiveness of texture that was both impressive and calming. They weren’t hiding behind butter, cheese, or even garlic. One of the guests, a local practitioner, had brought homemade lotus leaf packets of sticky rice studded with chestnuts and beans. It tasted wholesome but not aggressively so, the way whole-grain foods sometimes feel. The same was true of the soup, a vegetarian yukgaejang that was spicy and full-flavored even without the meat. This kind of flavor doesn’t come easily, though. With so little added, the ingredients have to be of the highest quality. 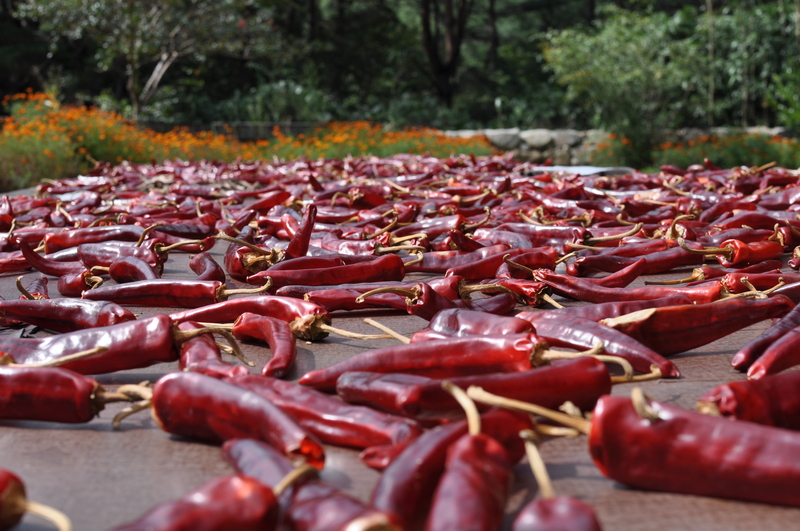 All around us, we could see what kind of work went into this kind of food—buckets of pine cones from which pine nuts had been painstakingly plucked and broad platforms where red chile peppers were drying in the sun for the best kind of gochukaru. I’m not giving up my garlic. I don’t have the purity of mind or the energy of body to do the work I would need to do, which might explain why I will never be a Buddhist monk. Instead, I am the kind of girl who will run an entire bucket of peeled garlic cloves through a food processor to store and use in the freezer as necessary. But I might have some garlic-less days every once in awhile. I think it’s easy to eat and eat and eat, and not even taste what we’re eating any more because we’re so used to it. Pork tastes better when you don’t eat it everyday, and the same may be true of garlic as well.